This viewer shows you all Services, Characteristics & Descriptors and their details of Bluetooth Low Energy / BLE / Bluetooth Smart devices. Bedford can use the native Windows 8 / Windows 10 API to access Bluetooth Smart devices. You must first pair the device in the Bluetooth Settings of Windows. If the pairing fails with ‘Driver Error’, disable and enable the Bluetooth device in the device manager. Further, Bluegiga BLED112, STM32WB55 and Texas Instruments CC2540/41 based adapters like Sensor Tag Development Kit are also supported. There is no need for pairing. These adapters are supported on all Windows versions. 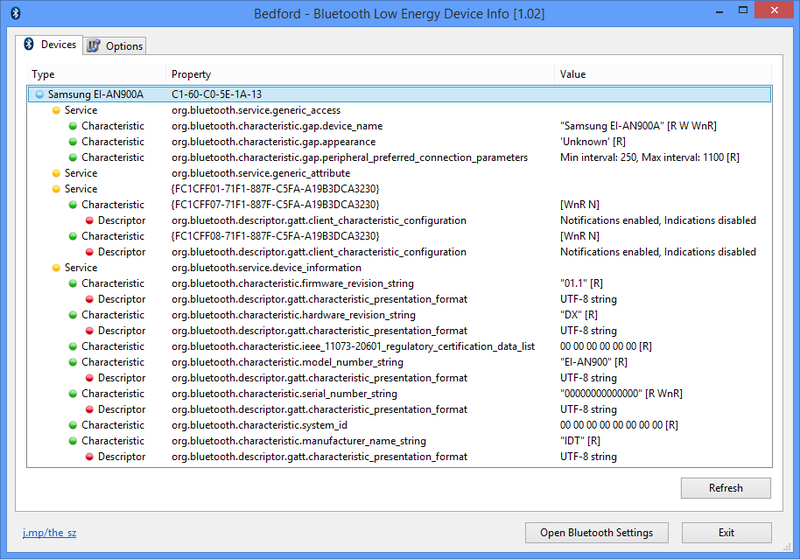 See all characteristic strings of Bluetooth Low Energy devices. It’s also shown whether the characteristics are Readable, Writeable or supports Notification.